Gamestop moving to take the “Game” out of their name? Even though it’s estimated that the gaming industry will total $18 billion by 2015, beloved video game retailer, Gamestop, is reportedly closing 120 to 130 of its worldwide stores by January of next year. 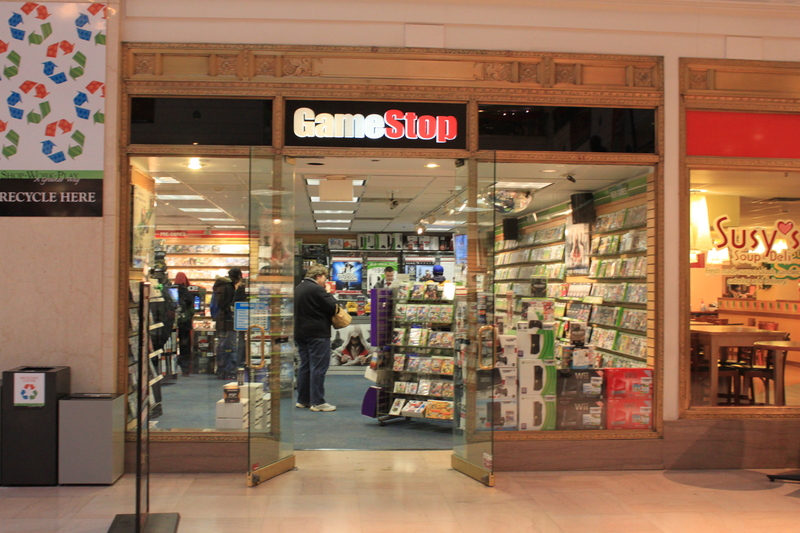 CEO Paul Raines made the announcement at Gamestop’s 2014 Investor Day on Wednesday, with the excess unsold merchandise likely to be traded for a low cash payout. On the surface, this doesn’t seem to be that major of a change, since that’s only roughly 2% of their total 6,457 retail locations, but the closures are just a part of the overall broadening of the company and a step away from the sale of physical game disks and refocusing toward expanding its subsidiaries in the mobile market. What concerns me is that this diversification seems to be motivated by the likely collapse or at least downsize of the physical-media gaming market. If you take PC games as any indication, there are far less physical disks being purchased and gamers are instead turning to Valve’s Steam Store for their new games. Also used games, which are a cornerstone of the Gamestop market, seem to be dwindling as a source of revenue as the trend towards online game purchases continues. This begs to ask the question: Is Physical Media, particularly video games, a dying industry? In my opinion the answer is no. Digital media has quite a few advantages, (it enables users to purchase and play games fairly quickly and conveniently, doesn’t require physical storage, is far easier to organize and locate and eliminates the risk of wear and tear damage to your disks) and I have purchased quite a few digital games myself, but I still don’t think that digital is ready to completely replace physical media and I don’t think it should. For one, a new game will require about 15 gigs of storage on a hard drive in order to play, which would limit the amount of different games you can have installed at one time unless you spring for larger storage. Another concern is the time it takes to download these games over wifi, with some games averaging about 8-10 hours to download on a strong signal. There’s also always a risk of electronic blackouts, like what we saw with the Playstation Network back in 2011. The thing that turns me off the most about digital only media is that you do not own digital media, you just pay for the privilege to use it. I’d much rather have access to the disk and be able to do what I want with it, like let a friend borrow it or even resell it to get money for the next game. So there you go, fellow media fans. Gamestop may soon be “GAMEstop” in name only, but hopefully this rebranding doesn’t speak for the future of all physical media just yet. Readers of The Media Chick, I present to you a typical morning in the marriage of Nick and Amy Dunne. We join them at their mansion on the Mississippi river at 6:00, the morning of their 5th wedding anniversary. Nick wakes up and walks down the stairs to see his wife, already in the kitchen humming the M*A*S*H theme song (“Suicide is Painless”) and making crepes. Nick leaves for work and goes about his normal day and when he returns home that night…Amy is gone. Nick and Amy met at a Brooklyn party. Eight months later they run into each other again and date for real. They eventually get married. Life is good until Nick and Amy both lose their jobs (Gillian Flynn used her personal experience getting laid off as a writer for Entertainment Weekly) and have to move to Nick’s hometown of North Carthage, MO to care for Nick’s ailing mother. Amy hates having to leave the city and everything about the small town she’s relocated to. This leads to fights, infidelity, and money troubles and all of the basic staples of a failing marriage. When Amy goes missing, Nick quickly becomes suspect #1. This is the normal plot flow of a basic crime story, but please don’t let that fool you. These facts are simply the foundation of the elaborate game of chess that author Gillian Flynn has penned. The story is told from both Nick and Amy’s points of view, and each narrator talks directly to the reader. Nick’s story starts in the present and the day she disappears while Amy’s passages are grounded in the past, thanks to a secret diary. Amy’s diary starts when she first meets Nick and tells a very idyllic history. You can see that Amy and Nick really loved each other in the beginning, and they seemed to have the perfect life. When the fights start, Amy tries her hardest to keep her husband happy. But the worse things get between the two she grows fearful of her safety from her abusive husband, to the point where she thinks she needs a gun to protect herself. Things don’t look very good for Nick. He’s a classic “unreliable narrator”, lies of omission that begin so subtly at first that you don’t even notice. However during the first few chapters, you start to realize he’s only telling everyone what he thinks they need to know. “It was my fifth lie to the police. I was just starting.” Even the things he does let slip are unsettling: he has a hot temper, he just increased the life insurance policy for Amy recently, and not to mention the young woman whose calls he keeps ignoring. Amy has her own puzzling history too, her parents wrote a series of children’s books called “Amazing Amy”, starring their fantasy version of their daughter. Their constant pushing towards perfection may have been too much for Amy to take. The books brought fame and fortune to Amy’s family but Amy had to grow up with a constant threat of stalkers, and when her parents fell on hard times in her adulthood, they took back her trust fund and any money she was given from her identity being used. She planned a treasure hunt on every anniversary with Nick, which was more of a test than a gift. Each clue leading to some special place that they shared to see how much Nick remembered. He always failed and she was always upset. READER BEWARE! You can’t believe everything you read in this novel. 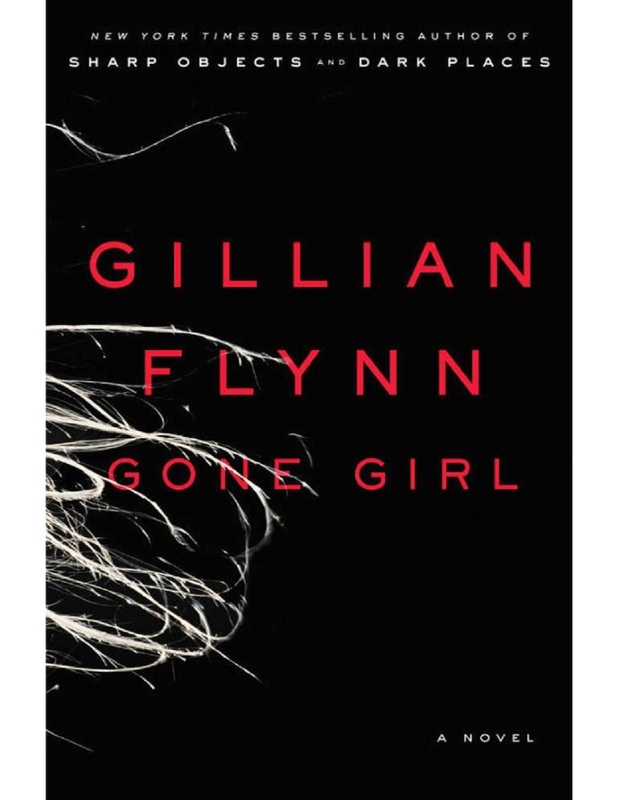 Amy and Nick are extremely experienced at the art of deception and lies.It’s these twists and turns that make Gone Girl so interesting. I won’t spoil here the big reveal that happens in the book, nor the ending because it’s much better if you just read for yourself.I got through the novel in less than a week, which is definitely the sign of a great read. What I really loved, besides the captivating plot, is the writing style. You may agree or disagree with what Flynn’s characters are saying but no matter what, you will have a strong reaction. I hope you enjoyed my review, and please let me know what you thought of the book. It’s Joffrey Baratheon’s wedding, but Cercei Lannister is NOT having a good day. When the Red Wedding took place at the end of last season, it came as quite a shock. I, and many other viewers had been lead to believe that the show’s central conflict was that between the arguable protagonists, the Starks in the North and House Lannister, currently occupying King’s Landing. By wiping out most of the contending players from the Stark family and at least temporarially ending the War of the Five Kings, we were left wondering what could possibly take that conflict’s place. (Well, at least until Danaerys marches in with her army and dragons, annihilating everything in their path) But that’s one of the great things about Game of Thrones. No matter how much you think you have figured out, it only takes a second for everything to be turned on its head. From the moment Ned Stark’s head was swiftly seperated from his body in season one, this show has been able to reinvent itself over and over again. Tonight was no exception. A theme I noticed tonight is that of identity crisis. Nearly every major character seemed to be going through some sort of internal struggle. Who is the kingslayer without his fighting hand? Can Cercei give up her power to the new queen? Can Ramsey overcome the circumstances of his birth and truly be a Bolton? Is Theon even still a person? The scenes with Theon, Ramsey Snow and his father especially drive this point home. His father is so disapointed with Ramsey for harming Theon that he tries to take any delusion that he’s a true son away from him. Pretty much the only hope Ramsey has of getting back in his father’s good graces is for the (non)Bolton son can try to kill the (non)Stark son and find Bran and Rikkon. I’m looking forward to watching the two “Snows” go head to head. The episode began with the unlikely dining companions, Tyrion and Jamie. Now that Jamie is down to one hand, the brothers have never been on more equal footing. It’s almost as though they are equals throughout this scene, and I have to admit…I like this new humbled version of Jamie, even if Cercei doesn’t. 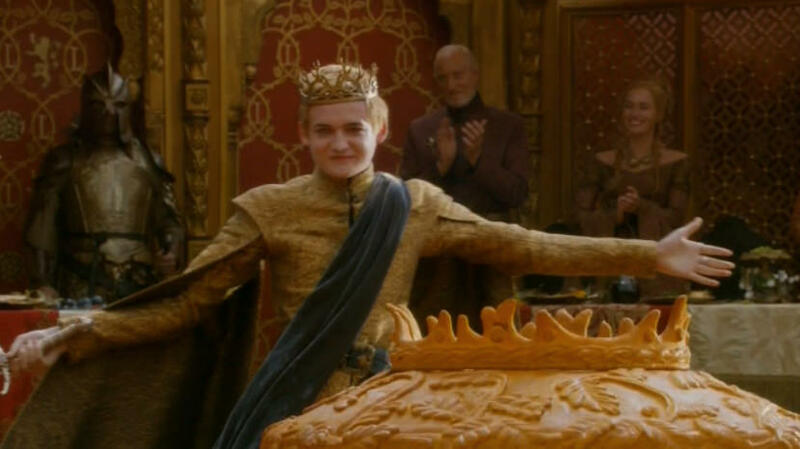 Joffrey, Joffrey, Joffrey…we knew it had to end sometime. He was just too much of a sadistic chicken to remain seated on the iron throne, but he also was the character everyone loves to hate. There was absolutely no chance of redemption for the character either. It was even more unsettling to watch him try to act civilized during the gift presentation before his wedding than when he acts like his old self. He almost seemed to actually appreciate Tyrion’s gift of a book. There was the briefest of moments, when Margery announces that the leftovers will feed the poor, where I actually thought that the marriage could have had a positive effect on Joffrey but just like his fake-nice act it didn’t last long. With the announcement of “There’s been too much amusement here today” suddenly it’s midget theater! If I get a chance to rewatch before next week it might be fun to do a count of all the people in attendance that this “show” is meant to offend. And despite everyone’s best efforts to keep up this illusion of “peace” in Westeros, (“Look! The Pie!” Very nice effort, Margery. Its a shame that most of those doves of peace are sliced in half.) Joffrey just can’t help himself from subjecting his uncle to more public humiliation. There probably aren’t many people left in the kingdom who doubt that Joffrey deserved to die, but Cercei is damn sure going to make sure someone pays. -Breaking up is hard to do , Shae. Let’s just hope you’re on a boat and sailing away. Although something tells me that a very unhappy ending is in store for these starcrossed lovers. Moulin Rouge anyone? -It’s ironic that the witch is burning people at the stake. Also, Stannis’ story is probably the strangest and the one I care the least about. The traditional sound of folk songs has been given a modern update recently in popular music, thanks to the popularity of bands like Mumford and Sons, The Lumineers and Noah and the Whale. 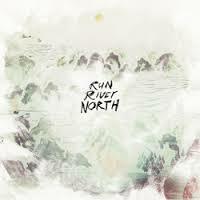 At first listen, Run River North has a similar sound to many of their contemporaries in the crossover folk genre. I immediately thought of the indie-folk band Of Monsters and Men, also recently formed, with their blend of male and female vocals and emotion evoking harmonies. What sets Run River North apart, however, is that the musicians (Daniel Chae, violin and guitar; John Chong, drums; Joe Chun, bass; Alex Hwang, singer/songwriter; Sally Kang, keyboard; Jennifer Rimm, violin) are all Korean-American and use their own personal experience, and that of their ancestors as inspiration. Most notably, their song “Foxbeard” speaks of the harsh limitations of their immigrant grandparents. My personal favorite song is “Lying Beast”, which begins quietly with hushed verses sung in unison, with a simple hummed melody that serves as its chorus. From there the intensity of the instruments build and when the simple melody repeats, it is sung in full voiced rich harmony and crescendos that crest and fall. Produced by Phil Ek, the songs don’t have as much polish as the Of Monsters and Men album, but that isn’t necessarily a setback. Instead, I find the acoustic, stripped down sound to give the album a much more intimate feel. It shows that they have the raw talent and sound just as good live as they do recorded. All in all, it’s a fantastic debut album from a band I will be watching closely in the future.